Just don't go swimming there! 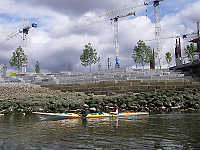 False creek is far from it's natural state - it is basically a man made body of water. The inland part used to be large tidal estuary but it has been dedged, filled and walled to fill the needs of industry. The land surrounding was once full of industry (lumber mill's, rail yards and manufacturing) but that is now mostly gone, replaced by residential buildings and people. False Creek really shows off it's urban side at night as a giant reflecting pond for the city. 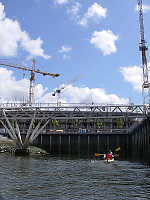 The water is crossed by three large bridges, the Cambie Street Bridge, the Granville Street Bridge and the Burrard Street Bridge. 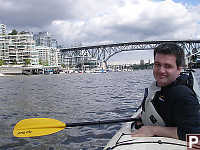 Granville Island is on False Creek and there is a place that rents Kayaks. It makes for a great few hours if you are into self propelled entertainment. We have a kayak camping trip coming up and David wisely wanted to get some practice in before we committed ourselves to a long trip well beyond our skills or endurance. 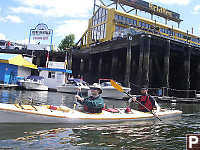 There is a Kayak rental place down on Granville Island and we managed to get four people together to go for a bit of paddle. 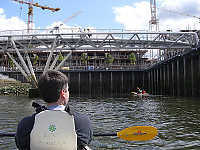 We headed up the inlet to the calmer waters on the other side of the Cambie Street bridge. The huge Millennium Water construction site (with it's crazy number of cranes) dominates the horizon. The condos are a long ways from complete (but progressing at terrific rate, even by Vancouver standards) but some of the amenities such as the redeveloped oceanfront sea wall are almost complete. It's amazing to see so many condo's coming on stream all at the same time - I believe there must be terrific risk in creating an "instant" neighborhood. The Dragon Boat races are coming up soon so there were lots of boats out on the water getting practice in. 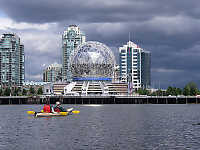 Science world is kind of a hub for this kind of activity so we had to dodge a few boats as we went to farthest end of the inlet. We only rented for two hours so we couldn't really hang out too long. We stopped in at Yaletown for a coffee (Why isn't there a starbucks on the dock yet? 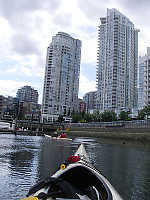 ), and paddled back to Granville Island to return our boats. Rarely, we do get cold weather and snow. When that happens, the city basically shuts down because we have so little snow clearing equipment and most people don't own snow tired. Since I live close to false creek that means it's an opportunity for me to go out and take photos!